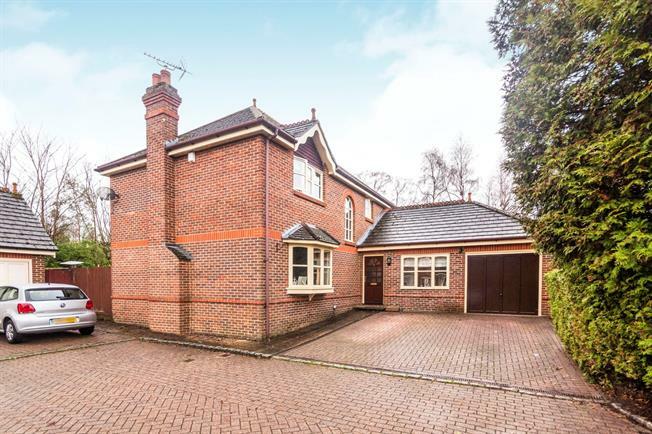 4 Bedroom Detached House For Sale in Lightwater for Asking Price £775,000. A very well presented four bedroom detached house situated within a small cul-de-sac close to Lightwater Country Park. The property has been extended on the ground floor and is spacious throughout. Accommodation comprises, entrance hall, lounge, study, cloakroom and a superb open plan kitchen/dining/family room. The first floor has a master bedroom with a refitted four piece en-suite bathroom, three further bedrooms and a modern family bathroom. Outside to the front is a driveway allowing off street parking and access to a single garage. The larger than average rear garden is fully enclosed with a large patio area leading to a further decked area offering fantastic entertaining space the rest is laid to lawn with shrubs and plants.